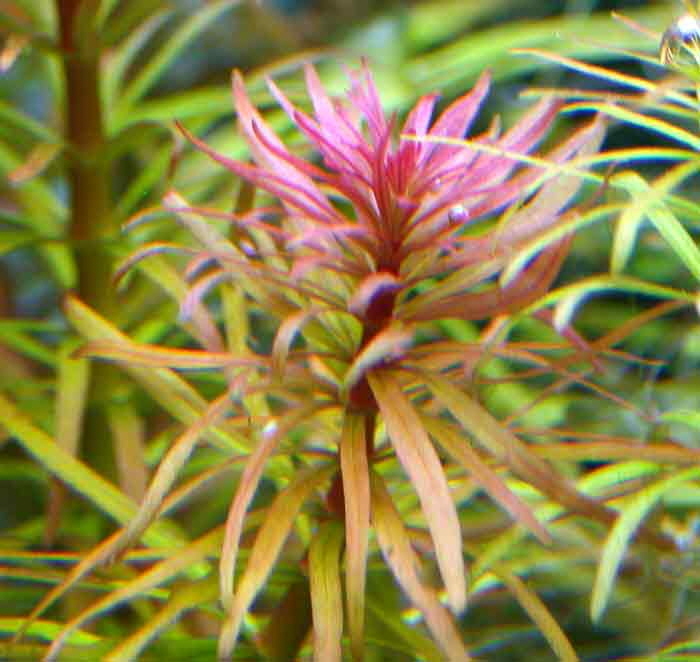 Scientific name: Ludwigia inclinata var. 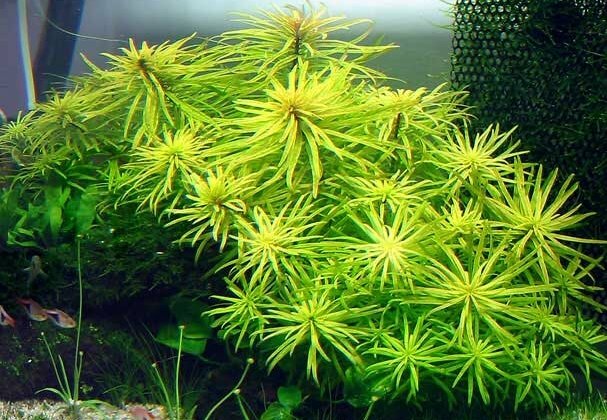 verticillata "Cuba"
Ludwigia inclinata var. verticillata is a beautiful stem plant. 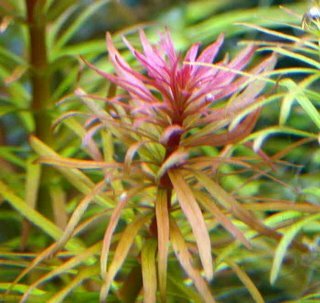 Its whorls of copper colored leaves can add a bouquet of color to any aquarium, but this plant is not for the beginner. It is very demanding in terms of light and fertilization. 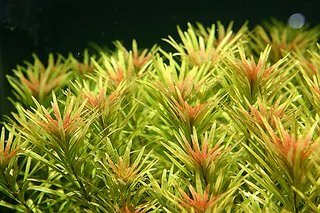 CO2 is a requirement as is regular NPK and trace element fertilization. Without CO2, the plant will have larger green leaves and will grow much more slowly and less full. It is a heavy iron user, and if new leaves are pale or white, the plant is not getting enough iron. It also demands high light, at least 3 watts per gallon. Each stem can reach 4 inches wide, so adequate space is also a must for this plant. 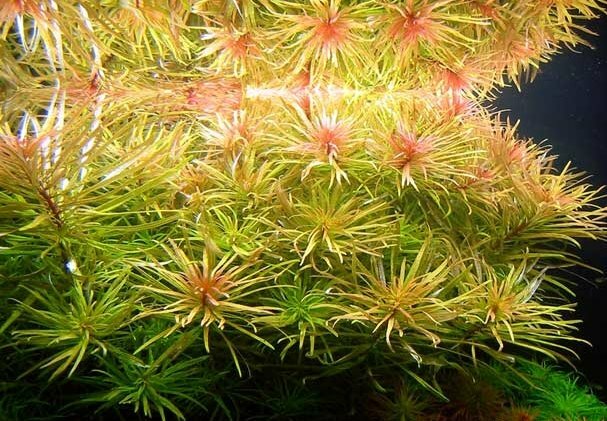 It will quickly outgrow most smaller aquariums. When the ideal conditions are provided, this plant will grow very fast and will form multiple branches and side-shoots. Trimming it can be difficult, however, since it does not handle frequent trimming well. If topped, the rooted portion may wither and die. Therefore, most aquascapers will remove the rooted portion and just replant the top. Below, you can see the variations induced by different conditions. Most likely, the differences between the two pictures is caused by lower trace dosing, lower light and CO2 (left) and higher trace dosing, higher light and higher CO2 (right). Although I don't have any experience growing this plant myself, I hope to very soon if I can get my hands on some trimmings. I also expect I will need to upgrade to pressurized CO2 first in order to get the CO2 concentrations necessary for healthy growth. All of the accounts I have heard about this plant though have been that it is a beautiful plant that grows like a weed if given the right conditions.